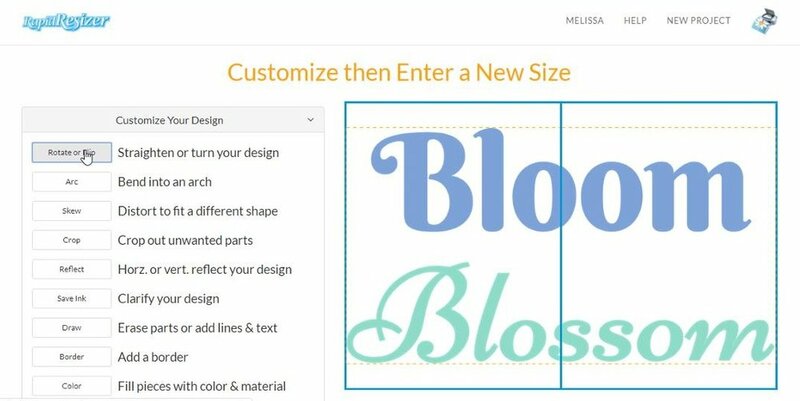 Watch the video below to learn about the Letter Stencil Maker, which can be used for free if you want to download or print your design on to a single page. If you are a paid subscriber to Rapid Resizer, you can print your design to any size across numerous pages. Begin on the main page where it says Letter Stencil Maker. On the left-hand side is the preview window which contains the word Design as a place holder, and any words there appear in the canvas on the right side. Click delete on your keyboard and type in your own word. To resize it, hover over the side of the word and a cursor with two arrows will appear which you can drag to resize. To place the word where you want it on the canvas, hover over the middle of the word and a cursor with four arrows will appear which allows you to drag it wherever you like. Click the heading that says Fonts and you will see these tabs that say: Calligraphy, Handwritten, Modern, Novelty, Sans, Stencil, and Symbol. When you click on one it will stay highlighted so that you can keep track of the section you are using. When you click on any font name it will change how your word looks in the canvas. If you need numerous copies of your word and want to save paper, you can hit enter to repeat the word and they will be identical. The fonts are listed in Alphabetical order within each section, so check all of the sections when you are searching for a specific font. If you don’t find the one you are looking for, click here to see if it is listed on Font Squirrel and send us a request using the Help button to add that font. As long as it has a license that allows it to be free for commercial use, we can add it. Add words in a sentence to create a phrase, or change the layout by clicking the Enter button after each word. If you want the word to be vertical, you can click the Enter button after each letter instead. If you want your design to use words that have different fonts, then you need to use the Add Text button. 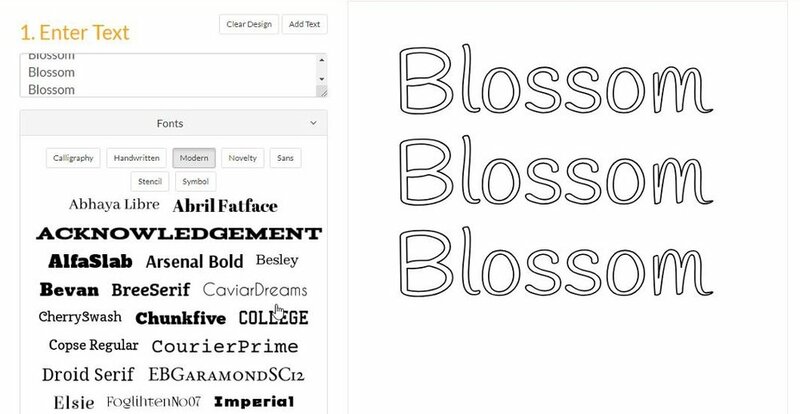 I typed the word Blossom, and just like the word Design was there as a placeholder when we began, now the word Text appears and is highlighted in the preview window so you can easily delete it. 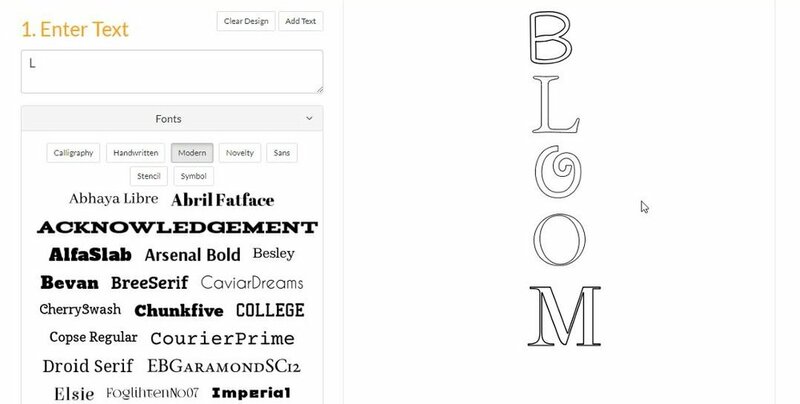 You can keep track of which fonts you have used as they are listed here below the Canvas. If you want each letter to have a different font, you will have to click Add Text and just add one letter at a time, and then click on it in the Canvas to choose a font for it. If you are using this as a free tool, it will say Print or Download on one page so you can click there to do so. If you are subscribed to the Rapid Resizer program, click the green button go to the Resizing page. Before you choose the measurements, you may need to customize your design using some of the tools in the drop-down menu shown below. Input your measurements, and you can see how many pages it will print across. You can choose to resize it proportionally, or by a percentage or part. You can choose the paper size, but make sure that your printer settings agree with whatever you have chosen. You have the option for using numbered pages, which can be helpful when you are taping them all together. And now, you can print your design or download it as a PDF, or email it instead. We hope enjoyed our tutorial and learned some ways to make great art projects. Thanks for watching!